Dark bay/black filly to make 16.2hh At the 2014 BEF Futurity Evaluations she was awarded an overall score of 8.95, just under Elite. She is very pretty, floats over the ground and has oodles of character! Very good to handle. With 75%TB blood, she is an ideal event horse prospect. His dam is a Group 1 winner retiring to stud after sustaining an injury during training. For more info please go to the Broodmares Page. 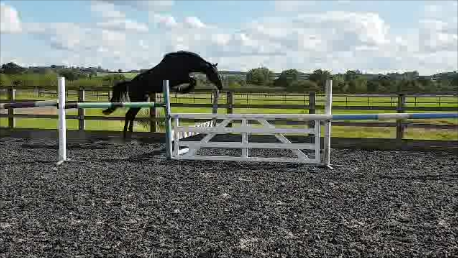 Has been xc schooling and started to jump a small round of show jumps. 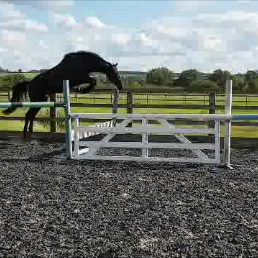 She has a very easy ground covering stride and is very correct in her jumping technique. She will easily succeed in the eventing field and with her presence, would be a BYEH candidate. She recently went to her first dressage party and won the Prelim 14 with over 69%, so gaining the all important marks in the dressage will not be a problem for her!